March 10th water protectors and like minded activist will be marching in Washington DC as well as all around the country to spread the message and to be heard when we say…NO MORE PIPELINES!!! 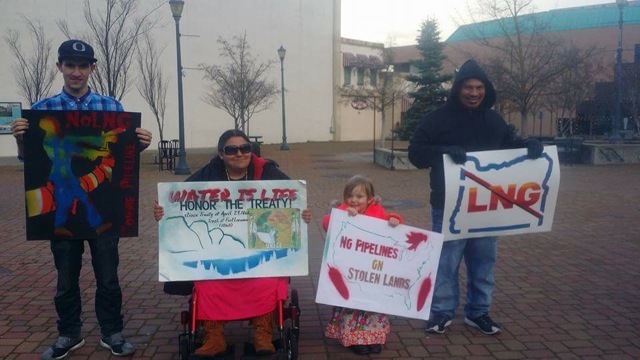 Southern Oregon can support this movement by attending our rally in solidarity with water protectors on March 10th at Vogel Plaza (by the statue playing chess by the theater in Medford). We will have speakers and songs and information on how you can get more involved. We will also be educating people on the LNG pipeline that would go through 400 water ways in Oregon and have major negative environmental impact throughout Oregon. We hope to have a great turn out and we hope to see everyone there.